Autoland Springfield NJ Dealership Contact Us Autoland: Should You Buy or Lease a New Car? Are you looking to ring in the New Year with a new car? If you're in the market for a new car, you've likely debated whether you should buy or lease. There are advantages and drawbacks to both, and the route you choose will depend on your financial situation and lifestyle choices. Read on to learn the pros and cons of buying and leasing a car. If you plan to drive the vehicle for a long time, then it's probably best to buy rather than lease. When you buy a car, you own the vehicle outright once the loan is paid off. Since you own it, there are no mileage restrictions, and you can customize the car any way you like. Another major advantage is you can build equity throughout the life of the loan, which can help you buy your next vehicle. And, as the owner, you can choose to sell or trade in your vehicle whenever you want. While you can often predict a vehicle's future market value, nothing is set in stone. Changing market conditions can affect the value of the car when you go to sell it or trade it in. Another drawback is buying involves a considerable down payment, with many lenders requiring 10 or 20 percent. It can also be difficult to secure monthly payments that fit within your budget. Many consumers are confused about how leasing a car works. When you lease a car, you pay the difference between the vehicle's price and its anticipated value at the end of the lease term. This is known as the residual value. Once the lease term is up, you return the vehicle to the dealership. 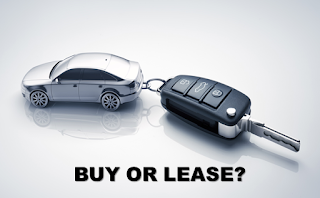 Leasing requires a smaller down payment than financing a new car. But, like with buying, the larger the down payment, the better your monthly payments. In most cases, the monthly payments for a lease are lower than a monthly loan payment, unless you have a high-value trade-in or hefty down payment. Leases typically last about three years. Leasing can be ideal if you prefer having the latest technology and safety features, as it allows you to drive a new car every three years. Another benefit is during the lease term, the vehicle is usually covered under the manufacturer's warranty, which can save you money on unexpected repairs. However, you are still responsible for maintaining the car, including oil changes, tire rotations, and so on. Failure to maintain the car properly can result in fees at the end of the lease term. Along with these perks, leasing has some drawbacks too. Because you don't own the car, there are restrictions on how many miles you can put on the vehicle. The typical mileage range is between 9,000 and 15,000 miles a year. If you do a lot of driving, this is probably not the right option for you. If you exceed the mileage, then you will have to may overage fees at the end of the lease term. You will also incur additional fees if you do not return the car in its original condition. It cannot be returned with any damages or alterations. Another downside is leasing is like renting; you don’t build any equity that can be applied to your next car. These are all important factors to consider when determining whether you should buy or lease a new car. Whether you choose to buy or lease, our New Jersey Toyota dealership can help you get the best deal on a new car. Visit our dealership, located on Route 22 in Springfield, today.